What is a Uniform Parcel Identification Number, hereinafter referred to as a UPI Number? 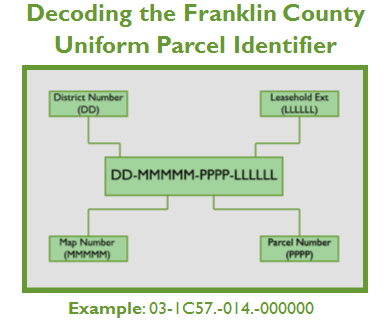 A UPI Number is a series of numbers that identifies each separate tract, lot, or parcel of real estate in Franklin County and will allow the identification of a particular parcel of real estate by number. The UPI Number format is a twenty (20) digit number which includes (-) and or (.). In addition to the current method of searching by owner(s) of the real estate, you will be able to search for ownership, mortgages, easements (i.e., utility rights-of way), and other matters affecting real estate, by entering a UPI Number. What is the effective date of the UPI Ordinance? The Tax Service/Assessment Office, the permanent depository of all county tax maps, assigns a UPI Number to each parcel of real estate recorded in Franklin County and certifies each existing UPI Number on documents to be recorded. Where do I find a UPI Number for a piece of property? A UPI Number for each parcel of real estate in Franklin County is found in the Tax Service/Assessment Office records. This (these) UPI Number(s) must be on each required document submitted for recording. 3. Public computers are available (limited availability based on customer demand) in the Tax Service/Assessment Office and the Recorder of Deeds Office. Searching can be done by owners name, property location or UPI Number. What if the parcel to be recorded is new, and does not have a UPI assigned to it? In the event that a newly created parcel is being recorded, it is still necessary to have the UPI on the document prior to recording. To obtain the UPI number of a newly created parcel, the UPI Verification Staff must be directly contacted – where they will assign the preliminary UPI Number. 1. New UPI Application – Fill out the form located here and submit it. This form is submitted directly to the UPI Verification Staff for review. The staff shall review the documentation, ensure a new UPI Number is necessary, and assign said new UPI Number if necessary. Those parcels missing adequate information for issuance will be rejected and a new form must be submitted. 2. In person visit – You are welcome to bring the documentation directly to the public counter in the UPI Verification portion of the Tax Service/Assessment Office for direct consultation by the UPI Verification Staff Furthermore, to ensure the newly created parcel is extracted from the correct parent parcel, it is also necessary to include the UPI of said parent property. Therefore a minimum of TWO UPI Numbers must be included on the document for newly created parcels. Where should the UPI Number be placed on the document? Each applicable UPI Number, provided by the person seeking to record a document, shall be placed at the TOP of the FIRST PAGE of the document to be recorded. The property address should also be included on the first page of the document along with township or borough of properties location. Why must I have my UPI Number certified? A UPI Number is certified in order to ensure that the UPI Number on the deed or other documents matches the County’s records for the parcel of real estate involved and the listed owners of the real estate, etc. With the ability to search real estate records by the UPI Number, the County needs to ensure that the document and corresponding UPI Number is correct BEFORE the document is recorded. What documents need a UPI Number prior to recording? Any type of Deeds, Easements, Right-of-Ways, Mortgages, Assignment of Mortgages, Release or Satisfaction of Mortgages, and other documents as stated in Franklin County Ordinance 2014-1: “…..Any writing evidencing an interest in realty in the County of Franklin, Pennsylvania, and which transfers or otherwise affects an interest in real estate and which is to be recorded in the Recorder of Deeds Office, other than a General Power of Attorney, UCC, Notary’s, Permits pertaining to highway plans, Release (Heirs to Estate) or a Deed of Dedication to a municipality for a road. 1. Deed, Quitclaim Deed, Declaration of Taking by Condemnation, Sales Contract or Agreement, Notice of Taking by Adverse Possession. 3. Mortgage, Assignment of Mortgage, Extension, Postponement or Subordination of Mortgage, Release or Satisfaction of Mortgage, Power of Attorney to Satisfy Mortgage. How quickly will UPI Number certifications be made? The Tax Service/Assessment Office intends to promptly respond to all certification requests. Legally there is a twenty-four (24) hour, or one business day, turnaround for the County to assign or verify the UPI Number. The amount of time that it takes to verify a UPI Number will vary due to the verification of information in a document. When all documentation is in proper order, certification should be completed within one day. For in person recording submissions, depending on volume, efforts will be made to expedite the verification process. We cannot guarantee same day verification after 3:30 (or slightly earlier) depending on document flow. Who is responsible if the UPI Number is incorrect? The person submitting the document is responsible for ensuring that the correct UPI Number is set forth on the document and certified by the Tax Service/Assessment Office. How much is the fee for the UPI Number certification and where is the fee collected? The fee is twenty ($20.00) dollars for each UPI Number affixed and certified. In the event of a single instrument containing multiple UPI Numbers, a separate $20.00 certification fee must be paid for each UPI Number affixed and certified. The fee shall be payable to the Recorder of Deeds Office, as the agent for the County, at the time the document is presented for recording with the Recorder of Deeds Office and shall be included with the recording fees. Is there a cap on fees when a document relates to multiple UPI Numbers? No, there is no cap on fees. A separate $20.00 UPI Number fee MUST be paid for each UPI Number referenced by the instrument. What is the process of certifying a UPI Number? Once the determination is made, the UPI Number(s) will be certified. The UPI Certification Stamp will appear on the ending page which becomes a permanent part of each document upon recording. What are the procedures for certifying a UPI Number and recording documents? After review by the Recorder of Deeds Office and deemed recordable, document(s) will be scanned and electronically forwarded to the Tax Service/Assessment Office Staff for review and UPI Number certification, then electronically sent back to the Recorder of Deeds Office for recording. The UPI certification stamp will appear on the ending page which is attached to each document when it is recorded. If the document does not have the required UPI Number and/or has erroneous information, the document and a rejection notice with a reason why it is being rejected will be given back to the person submitting the documents for corrections to be made. After review by the Recorder of Deeds Office and deemed recordable, the documents will be scanned and electronically forwarded to the Tax Service/Assessment Office for review and UPI Number certification, then electronically sent back to the Recorder of Deeds Office for recording. The UPI certification stamp will appear on the ending page which is attached to each document when it is recorded. Any documents without the required UPI Number or with erroneous information will be returned by mail unrecorded with a rejection notice that includes an explanation of the reason(s) why the document is being returned. After review by the Recorder of Deeds Office, recordable documents will be electronically forwarded to the Tax Service/Assessment Office for review and UPI Number certification, then electronically sent back to the Recorder of Deeds Office for recording. The UPI certification stamp will appear on the ending page which is attached to each document when it is recorded. All e-recording documents without the required UPI Number or with erroneous information will be rejected electronically, along with an explanation of the reason(s) why the document is being returned. What UPI Number is to be placed on a document when a parcel owner grants a utility easement over or under a portion of owner’s parcel? The UPI Number for all parcels the easement intersects. As it relates to the recording of subdivision plans, how will UPI Numbers be assigned and fees levied? The UPI Numbers will include only the existing UPI Numbers that comprise the property of which the subdivision plan is coincident. What UPI Number is to be placed on a document when a parcel owner grants an easement for a right-of-way to a neighbor? The UPI Number for the owner’s parcel. The deed should clearly state the purpose for the instrument; i.e. granting an easement or right-of-way. Click HERE to fill out an online application for a new UPI number.